Says Huyghe, “To start [a work], I always need to create a world. Then [I] enter this world, and that walk through this world is the work.” The works Huyghe creates become in turn evolving worlds that others can walk through, encountering living entities and environments that can range from intellectually provocative to hauntingly beautiful. If a traditional definition of sculpture is an object experienced in space over time, Huyghe’s practice expands the possibility of the three central precepts of this definition—object, space, and time. Huyghe’s achievements have deeply affected our understanding of sculpture’s possibilities even as he explores new avenues for his own work, delving into urgent issues raised by technology and media—identity, representation, community, knowledge—as well as enduring questions regarding time, exhibition ritual, and the role of the artist and our shared connections to each other. Huyghe developed his early work in actions—for example, returning items he had purchased to their original places on store shelves in Dévoler (Unsteal, 1994)—and their representations, exploring the ways that cinema and photography can shape our experience of the world, our sense of identity, and how we perceive and remember events. In Rue Longvic (1994), one of several billboard works, he placed a billboard on an old building; the photograph on the billboard showed a woman walking by the building, a doubling of the passerby in the photograph documenting the billboard’s placement. Manifestations with actors, questions of the ownership of a person’s experience and identity, and the creation of films based on these issues culminated in one of Huyghe’s best-known works, The Third Memory (1999-2000), about John Wojtowicz, a bank robber whose 1972 crime was sensationalized in the American media and inspired the Sidney Lumet film Dog Day Afternoon, starring Al Pacino as Wojtowicz; twenty years after Wojtowicz was paroled for the crime, Huyghe traveled to New York to ask him to share his version of the story in a set constructed on a soundstage in Paris to resemble the bank as seen in the film. Wojtowicz, who had long sought to reclaim his story from Warner Brothers, agreed. Huyghe filmed Wojtowicz reenacting and directing actors playing the roles of others involved in the robbery, then interspersed it with footage from Lumet’s film. Wojtowicz’s reenactment of the day’s events has uncanny echoes of Pacino, raising questions about the extent to which the very film said to have distorted an individual’s experience had in fact infiltrated his very memory of it. As The Third Memory suggests, collaboration has been a key element of Huyghe’s practice since the beginning, and it merged fruitfully with his concerns about the effects of technology, memory, and intellectual property in the project he undertook with the artist Philippe Parreno, No Ghost Just a Shell (1999), in which they purchased the rights to Annlee, the “shell” of a manga character. In addition to films by Huyghe and Parreno featuring Annlee, the two made the character available to other artists, including Dominque Foerster-Gonzalez, Liam Gillick, and Rirkrit Tiravanija. Eventually, Huyghe and Parreno signed a legal contract to yield their copyright to Annlee, bringing their use of her “shell” to its conclusion. Huyghe has been associated with relational aesthetics, a term coined by the critic and curator Nicolas Bourriaud to identify a new type of art based on human interactions rather than the creation of art objects. Bourriaud has defined relational aesthetics as “a set of artistic practices which take as their theoretical and practical point of departure the whole of human relations and their social context, rather than an independent and private space,” i.e. the museum or gallery. Building on Marcel Duchamp’s contention that the viewer completes the work of art through his or her response to it, artists associated with relational aesthetics often aim to broaden the context of art by emphasizing communal experience over the individual experience of objects, with the artist working to facilitate the occurrence of such interactions. Relational aesthetics is less a movement than Bourriaud’s designation for common interests he saw manifesting simultaneously in a number of artists in the 1990s. Yet even as relational aesthetics was being taken up and debated by the larger art world, Huyghe’s work was reaching beyond it in such projects as Streamside Day (2003), a celebration he devised for the new community of Streamside Knolls in the Hudson River Valley, New York that included a parade, costumes, a speech by the mayor, and fireworks; Huyghe created the conditions for the activities, then stepped aside for the community’s inhabitants to carry them out. However, the celebration itself was only one aspect of Huyghe’s project: he also made Streamside Day, a two-part film that began with his “score,” Huyghe’s term for the sort of creation myth he made for the town, which paralleled the trajectory of a young girl, whose family is moving to the new development, with that of a fawn—a “real” imagining of the beginning of the Disney movie Bambi—wandering through the forest and into one of the newly finished houses. This “score” was followed by a filmed account of the celebration. Huyghe’s approach to making art—to create a situation, set a scene, provide a set of conditions, then step back and allow things to unfold on their own—has grown to projects and exhibitions of almost mythic proportions, taking on subjects well beyond the usual purview of art. L’Expédition scintillante: A Musical (The Scintillating Expedition, 2002) presented, in three “acts,” staged in separate galleries, the “visual scenario” of a prospective expedition to the Antarctic. Within Huyghe’s “series of speculations on the unfolding of a still-absent collective project,” visitors entered a building animated by a program—climate, image, sound—and confronted a moored boat made of ice, slowly thawing, fog rising from a glowing monolith, and a skater cutting figures on a rink of black ice, disparate environments sharing the transformational states of water as solid, liquid, and gas. The set of operations that occurs has no script. Particular elements, images leak in a contingent reality – physical, biological, mineral – and grow without us. There is antagonism, association, hospitality and hostility, corruption, separation or collapse with no encounter. There are circumstances and deviations that enable the emergence of complexities. There are rhythms, automatisms, and accidents, invisible and continuous transformations, movements and processes, but no choreography; sonorities and resonances but no polyphony. There’s repetition, chemical reactions, porosity, reproduction, formation, vitality, but the existence of a system is uncertain. Roles are not distributed, there is no organization, no representation, no exhibition. There are facts, but no rules and no politics…. It is endless, incessant. After the visibility Huyghe gained from his 2013-15 retrospective and other recent honors, he mused about the possibility of making a work that is “indifferent” to the presence of viewers. Describing artworks as “hysteric objects” that “only exist when there is a gaze to attract,” he explained his aim: “I’m trying to make things indifferent to the idea of addressing the public…. Not that I’m indifferent to the public, but the works exist with or without its gaze. This impulse may have given rise to one of Huyghe’s most intriguing projects, Abyssal Plain. Geometry of the Immortals, undertaken for the 2015 Istanbul Biennale, in which an underwater concrete stage near the island of Sivriada becomes the site of cultural objects from the Mediterranean, including objects by Huyghe, deposited there from the surface, along with sea life brought to the stage by the force of a sea current. Unreproducible in photographs, virtually inaccessible, and still growing, the work leads its own existence, far beneath the waves. 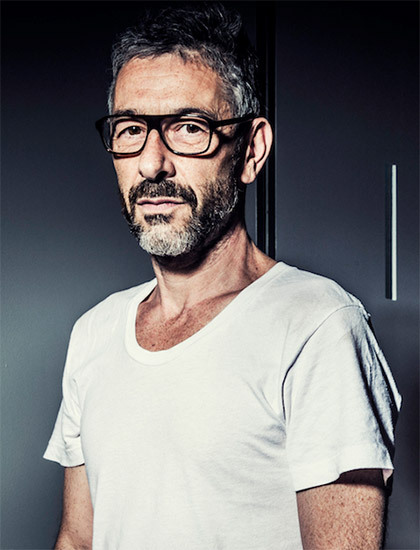 Pierre Huyghe was born in 1962 in Paris; he lives and works in Chile and New York. He studied at the Ecole Nationale Supérieure des Arts Décoratifs in Paris. In 2013, his retrospective opened at the Centre Georges Pompidou, Paris, then traveled to Museum Ludwig, Cologne (2014) and the Los Angeles County Museum of Art (2014-15). He has had numerous international solo exhibitions at such venues as the Metropolitan Museum of Art, New York (2015); Museo Nacional Centro de Arte Reina Sofia, Madrid (2010); Tate Modern, London (2006); Dia Center for the Arts, New York (2003); French Pavilion, Venice Biennale (2001); Kunstverein München, Munich (1999); and Secession, Vienna (1999). Huyghe has also participated in a number of group exhibitions such as the 32nd Bienal de Sao Paulo (2016); the 14th Istanbul Biennial (2015); Documenta 13 and 11, Kassel (2012 and 2002); 6th Sydney Biennale (2008); theanyspacewhatever, Solomon R. Guggenheim Museum, New York (2008); Whitney Biennial (2006); and Traffic, CAPC musée d'art contemporain de Bordeaux (1996), curated by Nicolas Bourriaud. Huyghe has been the recipient of many awards and honors, including the Kurt Schwitters Prize, Hannover (2015); Roswitha Haftmann Prize, Zürich (2013); Contemporary Artist Award, Smithsonian American Art Museum, Washington (2010); Hugo Boss Prize, New York (2002); Special Jury Prize, 49th Venice Biennale (2001); and DAAD Berlin Artists-in-Residence, Berlin (1999-2000). Huyghe’s work is in the collection of many museums, such as Musée National d’Art Moderne, Paris; Museum of Modern Art, New York; Solomon R. Guggenheim Museum, New York; Tate, London; Museum Ludwig, Cologne; and such foundations as Fondation Louis Vuitton, Fondation Pinault, and LUMA Foundation.